Blackburn's Local Deluxe Rack can fit a variety of bikes, wheel sizes, and, given your bike frame has the proper attachment bosses, can even be used as a front or rear rack. Such versatility certainly deserves to be called “Deluxe.” Adjustable mount points give this rack its universal fit, and beyond that, it's also disc-brake compatible. A solid top-deck acts like a fender to keep you and your cargo free from road spray, and a 45 lb load capacity means you'll only be limited by the cleverness of your packing. Claimed weight is 990 g. Includes mounting hardware. I purchased this rack thinking it was the best option for versatile usage on my commuter (Novara Safari, size L). I had thoughts of trying it on the rear first and then possibly the front (if I liked it enough to buy two). What I learned is the the rack was very challenging to installmount, compared to other racks I've used. The reason had everything to do with the way the attachment arms that connect the rack to the seat-stay braze-ons. They are quite long and made it impossible to get the rack to sit level. After multiple attempts I came up with a way of jury-rigging the rack-end of these arms to attached to the horizontal supports rather than the front 'V' support that they're supposed to (according to instructions and video). This made it almost possible to be level, but still it tilts back slightly. I would have considered returning the thing were it not for that fact that I ended up bending those support arms whilst initially struggling to mount them. Bottom line I would not recommend this rack unless you have a very unique size bike frame or need specialized mounting options (i.e. cantileverframe clamp mount). Otherwise, it's solidy built and very sturdy. Blackburn should stop advertising this as a front rack. 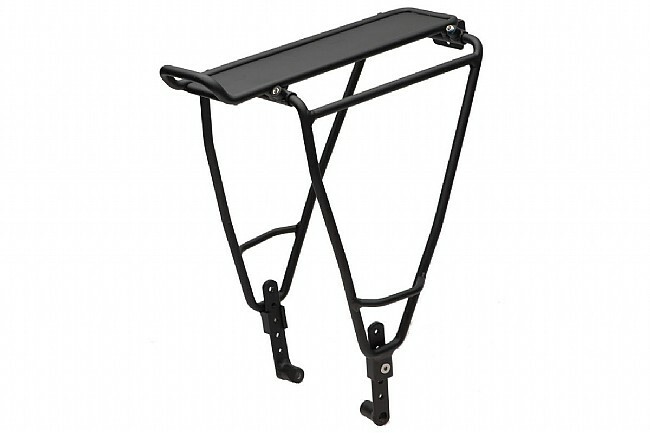 In many instances (read the reviews) and in my experience it will not fit as a front rack. I contacted Blackburn customer service. They responded with links to their YouTube installation videos - which only show how to install on the rear. Front installation, at least on a bike with disc brakes presents several problems. The rack is designed to either mount to caliper or cantilever brake arms (not possible since I have disc), or to fork braze ons. But even when adjusted to its narrowest width, the extenders with eyelets on the end will not align. Blackburn's advice? contact your local bike retailer for assistance with installing your rack. Sorry for any inconvenience. Yeah Blackburn, I'm sorry too. Not an insurmountable problem, but worth noting, that the bolts provided for mounting to the fork eyelets in lieu of an extra long quick release skewer are far too long and when tightened will strike your hub. This rack is very adjustable and very rugged with one weakness, the mounting flange. I mounted it on the front of my back-road touring bike. I had to fabricate a piece to connect the flange to my fork. While riding with a 4.5 pound load on the rack, the flange broke. I emailed Blackburn with pictures. They provided excellent customer service and sent me a replacement rack. This time I will fabricate a connection piece that will reinforce the flange. Blackburn makes quality products and backs them up. Installing this took a little patience and planning. I'm not sure I would recommend this one, though. The adjustability features are a draw, but it ends up being a bit of a hassle to get it all centered and secure. I put Blackburn Local Panniers on it and finally figured out how to make it all work together. Very strong and light rack. Primarily for disc version...but i was able to also use on non disc version by flipping triangle mounting attachment . So i can use on mtb and grocery getter. Comes with all hardware and easy to install. A multitude of ways to mount it.